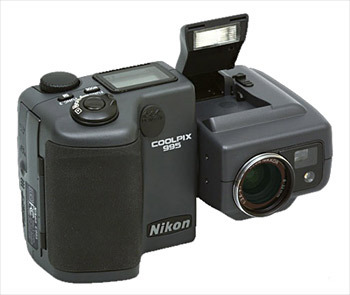 I have an elderly Nikon Coolpix 995, which I love. I, or at least my company, also owned two of its predecessors, and while newer cameras may have more megapixels, and be easier to wear on one’s belt, the optics on these were great, and the twisty design proved useful over and over again. Anyway, I was distressed to see, last time I used it, that it had developed a few ‘hot’ pixels. These are failures in the CCD sensor, which show up as bright pixels in the same place in every image, especially when a long exposure is used. To have a few failures is normal, and some cameras have the ability to remap such dud pixels so they don’t appear in the final image. Normally, this would involve sending the camera to Nikon for servicing, but I came across a Windows utility called CCD Defects Reader, written by a Russian chap named Paul. It works with several of the cameras in the Coolpix range, and sure enough, after rebooting my Linux box into Windows to run this, my dead pixels had vanished, and a photo taken with the lens cap on was beautifully black, instead of looking like a map of the night sky! Here’s an account from somebody doing the same thing with a Coolpix 5700.